GemThane is a Canadian based manufacturer of pre-finished, low maintenance wood siding. GemThane’s revolutionary polymer coating process has made this company a leader in producing wood siding, wood decking, and dock products that stand above their competitors in terms of durability and overall performance. In 2006, the company began producing wood siding and soon after recognized the need for similar low-maintenance products for decks and docks. GemThane’s parent company Madison Chemical Industries Inc. took on the challenge of developing a process for producing pre-finished wood that could withstand the harsh exposure of deck and dock applications. Several years of development and testing led to the very successful launch of their Dex N’ Dox product line in 2009. When GemThane contacted Pacline they were looking to replace their existing conveyor system with a more robust system which could more efficiently handle the transportation of 16 foot long wood siding and deck boards through the paint and curing processes. 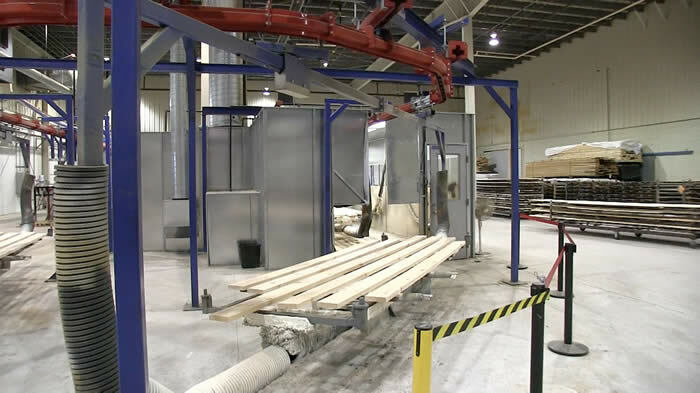 Manage the long boards around the curves in the system and through two paint booths and ovens. The conveyor solution for GemThane was the PAC-MAX™ heavy duty enclosed track conveyor. This conveyor has the capability of handling heavy load requirements. In addition, the enclosed track feature was important to help keep the system clean through the wet spray paint process and minimize overall maintenance costs. Selecting the conveyor was the easy part of the solution. As with most conveyor systems the real challenge is often in the overall system design and the customized components required to handle the particular part being conveyed. In this case, the final conveyor system consisted of a single looped track, with 8 highly customized carriers, each 20 feet long. These PACLINE designed carriers included a sophisticated tilting and locking mechanism for the wood boards. They also included custom light-weight covers to fully protect the tilting/locking mechanisms from paint. Also, special guides were incorporated into the carrier system to prevent the large frames from swaying and to help move them smoothly in and out of the paint booth. Due to the extreme length of the parts (wood boards) and the carriers, PACLINE incorporated a “bar trolley” mechanism into the carriers, which allowed half of the carrier attachments to float horizontally. This allowed the 20’ long carriers to move smoothly around horizontal turns without causing chain jams. In terms of controls, PACLINE provided a touch screen (human machine interface) control system with proximity sensors and a custom interface for stops and starts. The system was programmed with a maintenance mode, lubrication mode, auto and manual run modes and a system status check as well as fault alarms. In addition, the controls included logic to interlock the customer’s paint spray guns with the paint booth ventilation fans. This increased safety as the the system was programmed to prevent spray guns from turning on if the paint booth fans were turned off. This feature could be manually overridden with a password. 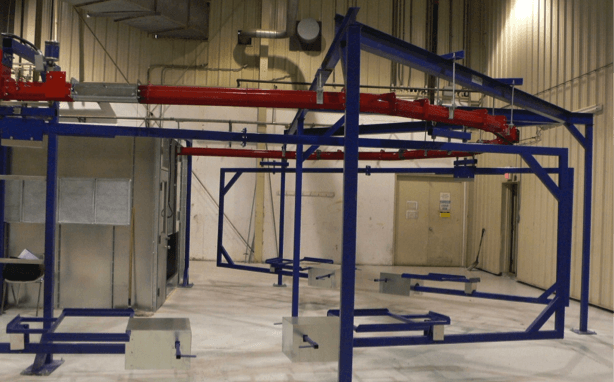 With PACLINE’s test facility in Mississauga, the complete system including the custom carriers and control interface were all fully tested prior to shipping to ensure the system would run flawlessly once installed on site.